I get a lot of emails about mobile internet in Australia. How does it work? Which carrier to choose? Because I use mobile internet in Australia and New Zealand, here’s a guide to this popular travel related topic. In this part I will talk about the different network carriers and their networks. In Australia all major carriers offer prepaid tariffs, like in Europe and Asia. Unlike in Europe, they use different networks. Which means that you should look for a provider that matches with your smartphone, netbook or internet stick specs. More on that later. Telstra is Australia’s largest network provider and has a mobile network that reaches even partially into the outback. Telstra uses 3G/UMTS 850 MHz as their main network technologyy. There is also a 2G network based on GSM, but this is only available in larger cities. There is also the provider Vodafone Australia, which has a GSM network. Just like Telstra, Vodafone Australia also has a 3G network based on UMTS. It uses the in Europe common 2100 Mhz frequencies in major cities and 900 Mhz in “regional areas” (rural roads, small towns). Additionally Vodafone also builds a network on 850 MHz to increase existing capacity. The third major player there is Optus, which also offers a 2G network based on GSM and a 3G network based on UMTS. Optus also uses 2100 Mhz in major cities and 900 Mhz in “regional areas”. 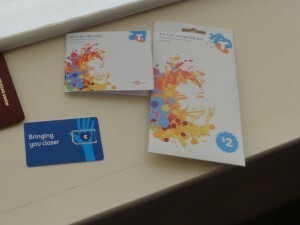 Did you choose for Telstra, it’s very easy to get a sim card. You can get Sim Starter Kits for $ 2 AUD in the branches of Australia Post. It must be charged with a balance, because it comes without talk time/sms/data allowance. Alternatively, you can go in one of the Telstra stores. To activate a Telstra sim, you have to call the phone number listed in the starter kit. At my first activation I was asked for my passport number and an Australian address. I said that I’m a tourist and therefore can only provide a hotel address. She immediately replied that it is no problem. Then I was asked if I want to activate the sim as a data sim (ie for netbooks, UMTS Sticks, ..) or for a mobile phone. A few minutes later I was able to go online, recharge my pre-paid sim and booked a data package. Please ensure that your device (smartphone, netbook, …) supports UMTS 850 MHz, as Telstra uses it for most parts of the network. My advice: Buy on arrival at the airport. E.g. there’s a Vodafone booth in the Arrival Hall of the Sydney International Airport where they’re already specialised in tourists. They have prepared appropriate forms and brochures. Vodafone uses for most of its network UMTS 2100 Mhz (same as in Europe) and 900 Mhz. I.e. Most European smartphones work in Australia with Vodafone Australia. My advice: Purchase a sim card at the airport. There is an “Optus! Yes” store in the Arrival Hall of Sydney International Airport. Optus uses for most parts of its network UMTS 2100 Mhz and 900 Mhz. I.e. Most European smartphones work in Australia at Optus. More on device compatibility in the next part of this series.